Reduction of viscosity of the tracheobronchial secretion in the supportive mucolytic treatment of chronic broncho-pulmonary diseases accompanied by abnormal secretion and mucostasis. Do not administer in combination with anti-tussives, this may lead to a hazardous build up of secretion due to the restricted cough reflex. 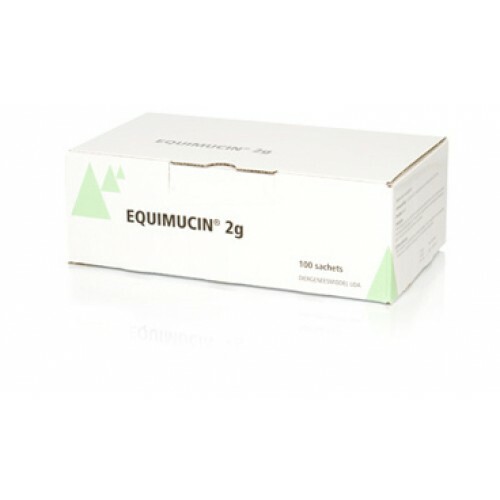 Equimucin® 2g, oral powder should not be used in horses suspected of suffering from gastric ulceration. As acetylcysteine is metabolised to sulphur containing products, use cautiously in horses known to be suffering from liver disease. Persons should wear gloves during administration. Hypersensitivity to acetylcysteine may occur. Should undesirable effects occur, withdraw Equimucin® 2g, oral powder and treat symptomatically. Laboratory studies in rats and rabbits have not produced any evidence of a teratogenic effect. Safety of Equimucin® 2g, oral powder has not been established during pregnancy and lactation. Use only accordingly to the risk/benefit assessment by the responsible veterinarian. Acetylcysteine must not be combined with other medicinal products as incompatibilities may occur. Reports of inactivation of beta lactam antibiotics (penicillins and cephalosporins) and tetracyclines have so far referred to in-vitro tests in which the substances were directly mixed. An interval of at least 2 hours should be allowed to elapse before administering these antibiotics (this does not apply to doxycycline). Acetylcysteine is compatible with potentiated sulfonamides and all current bronchodilators and can be administered concomitantly. Concomitant administration with antitussives may lead to a hazardous build-up of secretion due to the restricted cough reflex. Combined treatment of Equimucin® 2g, oral powder and antitussives should therefore be avoided. 10 mg/kg bw acetylcysteine twice daily (total daily dose of 20 mg/kg bw), during 20 days. Daily oral administration of 3 times the recommended treatment dose for a period of 4 weeks to horses was tolerated without undesirable effects. Milk*: zero days, to be considered in countries were horse milk is used for human consumption. Acetylcysteine can reduce the viscosity of bronchial mucus through reductive breaking of the disulfide bridges of mucopolysaccharides and trigger a mucolytic effect following oral administration. According to in vitro observations, acetylcysteine exerted protective effects due to the direct detoxification of toxins in the respiratory tract through reduction (e.g. of oxidising substances) and conjugation (e.g. formaldehyde). Free radicals can be bound and thus inactivated by the reactive SH group. These protective properties are not demonstrated in vivo at present. Following oral administration to man, acetylcysteine is rapidly and virtually completely absorbed and metabolised in the liver into the endogenous amino acid, cysteine, the pharmacologically active metabolite, as well as diacetylcysteine, cystine and other combined disulfides and inorganic sulfate. The bioavailability in man of orally administered acetylcysteine is very low due to the high first-pass effect (approximately 10%). Pharmakokinetic data in horses are not available at present. In laboratory animals acetylcysteine and its metabolites are excreted almost exclusively in the form of inactive metabolites (inorganic sulfates, diacetylcysteine) via the kidneys. Inorganic sulfate is the principal excretion product in urine. Small quantities of unchanged acetylcysteine are always present in the urine as acetylcysteine is a physiological intermediate. Cardboard box of 100 sachets, each containing 6 g oral powder. Cardboard box of 200 sachets, each containing 6 g oral powder. Cardboard box of 500 sachets, each containing 6 g oral powder.